In a world with so many foods to choose from it has become increasingly important to understand how food is grown, processed and affects our health. Pesticides are now detectable in our bloodstream and modern agricultural practices are harming our environment on many levels. Luckily we can choose to buy local and organic foods to reduce our exposure to harmful chemicals and avoid funding the food giants’ destructive practices. It can be difficult to eat 100% organic since it’s more expensive and not always available in our local grocery store. A down-to-earth solution lies in the home garden! Have you ever eaten fresh produce right out of the garden? Many of us may reminisce of days when we were treated with snow peas from Grandma’s garden, or perhaps succulent heirloom tomatoes your hipster friend threw into his “guac.” Think you don’t have the space to grow anything worthwhile? Think again. Any space is enough space to grow something. Patio gardens can produce more than you’d expect with some planning and minutes of occasional work. Utilize vertical space by fixing trellises to walls, railings or leave freestanding. Tomatoes, cucumbers, squash, zucchini, beans and peas climb these wooden or wire lattice structures, making them an essential component of the urban vegetable garden. Don’t receive a lot of sun? Take advantage by growing herbs and salad greens, and by sprouting sunflower seeds, peas, wheatgrass and more. Once you’ve determined the best crops for your space, it is time to germinate seeds. Late February to early March is the ideal time, allowing your plant babies to get a head start and thus making your garden more efficient. 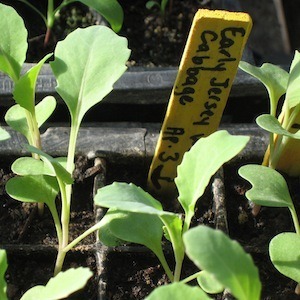 Raising plants this way saves you from buying seedlings from a greenhouse, which might not be organic anyway, and potentially doubles what your garden can produce. Seeding your own garden also lets you try out the multitude of unique and heirloom vegetable varieties, which are not usually available outside of farmer’s markets. Those who have tasted such delights understand the value of the home garden. The bounty is delicious, fresh, chemical-free and only costs time, well spent outdoors.